passes it by will depend on my efforts? That seemed too heavy a responsibility. The stakes were too high, especially on a nightly basis. In other words, whether or not they’ll embrace Torah depends more on the kind of pull they have Upstairs than any conversation I might have with them downstairs in the hostel kitchen. And so I took it on. It turned out to be a wild ride, with many life lessons and kiruv lessons learned along the way. Many times we realize only later how our own journey is intimately intertwined with the journeys of those we encounter. I knew one day I would have to write about it. Which is why I started to keep a daily journal that eventually became the book, It Happened at the Heritage House: Tales from the Legendary Jewish Youth Hostel. Besides being an entertaining read for the general public, the book is particularly useful for Jewish educators and mekarvim. The stories address issues such as Eastern thought and other religions, challenges of mental health and addictions, being both nonjudgmental and an attentive listener, feminism, intermarriage and answers to some of the most common questions. But I also hope that the stories themselves, that champion mekarvim who are dedicated to bringing Torah into others’ lives, will inspire their continued and persistent effort when they see how baalei teshuvah and their descendants are transformed forever! It’s summer and groups are arriving in waves. This particular breaker has crashed on our front door twenty minutes before sundown Friday night. Some groups come knowing that showing up at the hostel on Friday means they’ll be set up with a host family and experience an authentic Shabbos, and some show up unaware. This group seems to be of the latter sort. We make our way down to the others — about thirty in all — to light the candles that have been set out for each guest. The glow of the flames highlight the beauty of the arched stone windows. Everyone finds a seat, either on one of the bunk beds or on the couches that line the sunken living room. An anticipatory hush seems to emerge from the flames themselves. It’s as if we’ve entered a space between what they have known all their life and what they’re about to experience — the dancing flames like flags at the entrance of some new kingdom. I decide to share a thought about candle lighting before we make our way down to the Kosel for meal placements. “Notice how one flame can transfer to another wick — even a thousand other wicks — and the first wick is not diminished…” And so follows a short discussion on the nature of the spiritual versus the material and how Shabbos is a focus on the spiritual. Shabbos, I point out, is the seventh day of the week, and we talk about the significance of seven. Seven is the number of colors in a rainbow. It is the number of notes that make up a diatonic scale. The natural world is built on the number seven. Seven also represents the center point, the inner dimension, of the six-sided cube, which depicts the physical world’s dimensions. So too, the seventh day — Shabbos — is the central point that gives meaning to the other six days of the week. 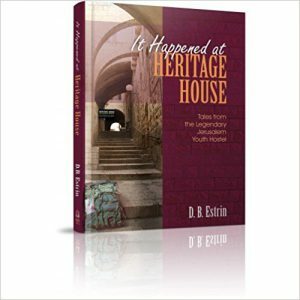 Dena B. Estrin is the author of It Happened at the Heritage House: Tales from the Legendary Jewish Youth Hostel… True adventures in the Old City of Jerusalem. Dena can be reached at estrindb@gmail.com, Tel. (+9722)-586-9095.